In Gear! 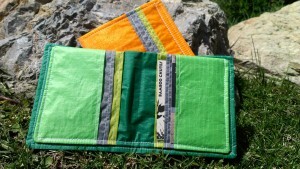 Upcycled Wallets Home | About Us | Opportunities | Sponsorships | Contact Us! We are so thrilled to share this week’s In Gear review with you! 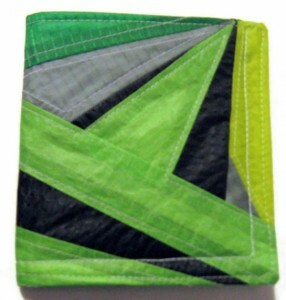 Last week we had the privilege of experiencing the upcycled wallets from Bamboo Chutes. 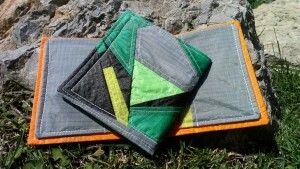 These amazing handmade wallets are created from retired paragliders and parachutes which have a limited number of usable hours for the sake of safety. The artisan behind Bamboo Chutes salvages the high-quality, lightweight materials used in these popular wind riders and transforms them into wallets the likes of which we’ve never seen before. From geometric quilted designs to layered placements that go perfectly with any style, we’re huge fans of what this shop is creating and we know you will be too. Enjoy! When shops upcycle, they are taking valuable, high quality, and like-new materials and giving them a new lease on life. These materials are destined for the landfill, but they are diverted to the craft room which helps our environment and adds something amazing to any personal style. 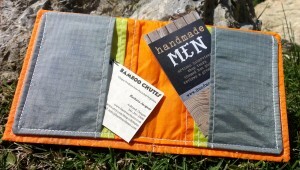 The Offchute Wallets from Bamboo Chutes are made one at a time, by hand, using professional grade ripstop nylon – the same stuff used to keep people safely in the air when they paraglide and parachute! The material is extremely lightweight, durable, tough, and simple to work with. It also comes in an array of vibrant colors that please any personal taste. This wallet design is clean, to the point, and really eye catching. The piece we reviewed had a full size bi-fold design that features an inner cash pocket and six card-size pockets. This hand-quilted style cannot be missed, and it comes complete with perfectly edges. 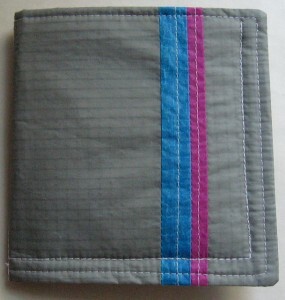 The piece we reviewed had an inner full size cash pocket and six card pockets. We used these wallets. I immediately transferred my back-pocket necessities to the wallet I reviewed and handed another over to a friend to get another perspective. At the end of the week we shared our finds. We both loved the wallet, how easy it was to use, and how many compliments it got. It hugged our cash and cards perfectly and felt very safe to carry, and it fit snugly in back pocket spaces and backpacks. The construction is clearly built to last, and if people trust this material to fly them through the sky, I’ll trust it with my debit card! Win! We love these wallets and give them our stamp of support through and through! These are the perfect wallet for men of any style, and we think they’d also make a great ‘my first wallet’ for a tween or teen considering how tough and usable they are. If you’re a fan of color, texture, geometric patterning, and unique style – this is the wallet for you! 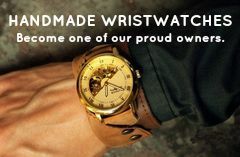 Click the banner below to grab your wallet now. There are several styles in stock all the time in addition to other great items like tote bags, eyeglass cases, sling bags, pouches, and more! 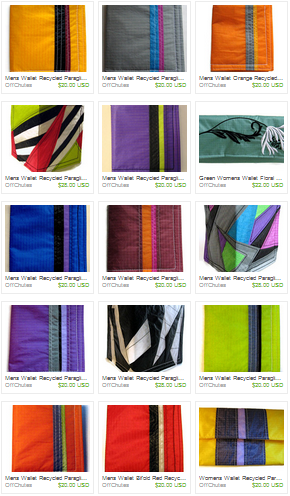 Tagged Bamboo Chutes, Offchutes, Recycled, Upcycled, Wallet, Wallets. Bookmark the permalink.